Today’s art combines a number of techniques into one unusual piece. 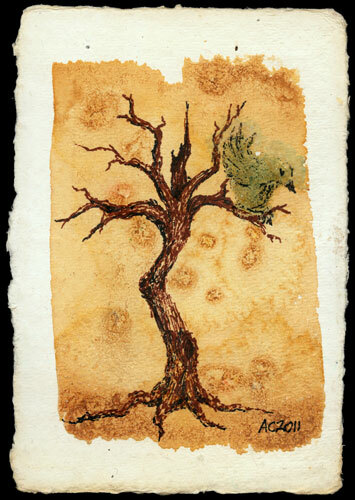 The base is a heavy, handmade postcard from India, part of a set I bought years ago with irregular, natural edges. 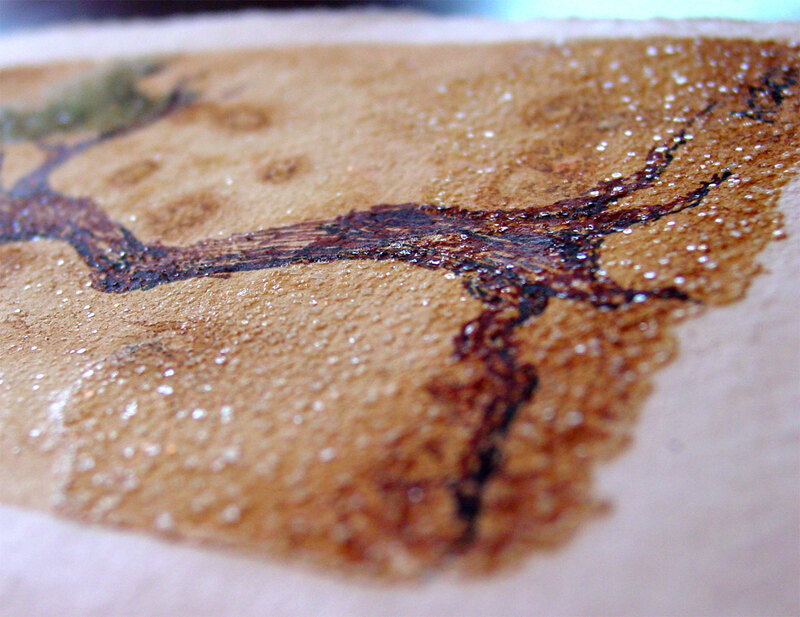 The wash was made with strong black tea, and the texture comes from salt crystals placed on the wet paper. 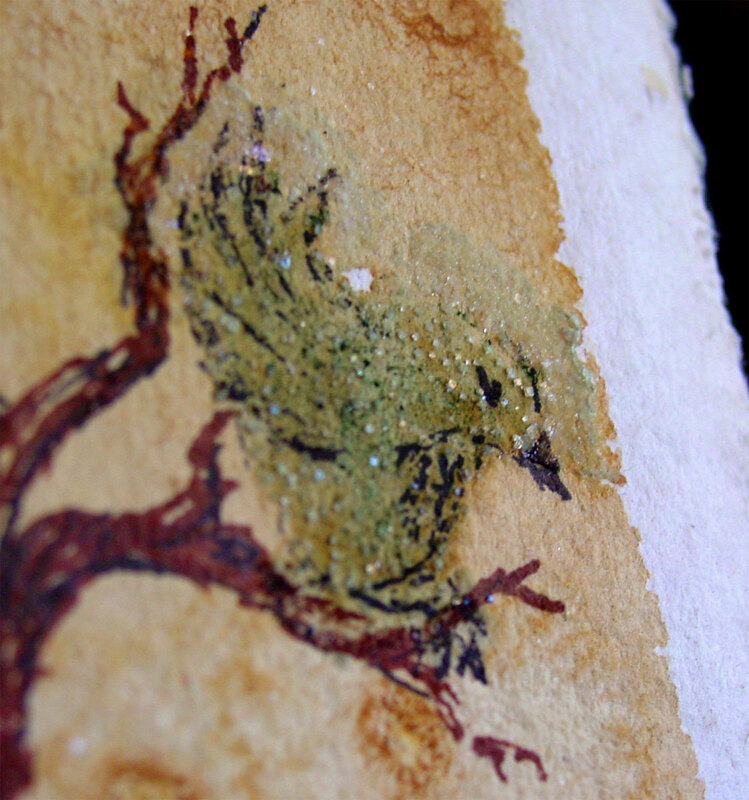 Then, I added a touch of blue paint and a little more salt to create the shape of the bird. I have to admit, once I saw a bird in the blue, I couldn’t help but think of Twitter, but I think that’s just a sign I spend too much time on social networks. I broke out my fine-point sharpies in brown and black to create the tree and the detail on the bird, using a loose, scribbly style to create an organic shape that fit with the background. 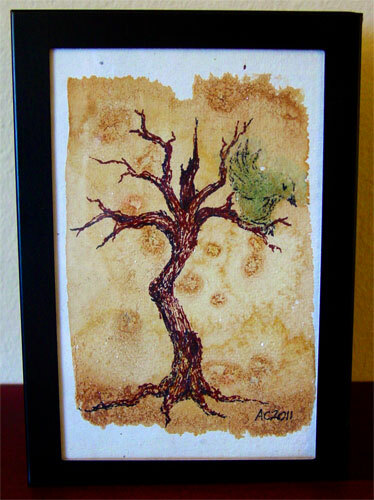 Twisted Tree, 4″x6″ mixed media on paper, nfs (sold). The bird ended up with a bit of an attitude, and I rather imagine him saying something like, “Yeah, yeah, tweet, whatever.” Despite that, he’s got a bit of sparkle to his personality, as you can see here. Actually, there’s salt crystals in a fine layer all along the lower part of the painting, giving it texture and a subtle glimmer. It looks quite nice in a simple black frame, and this painting, like always, will ship wrapped up safely and ready to display.